The NASA/ESA Hubble Space Telescope has captured this striking view of spiral galaxy NGC 7714. NGC 7714 is a spiral galaxy at 100 million light-years from Earth — a relatively close neighbor in cosmic terms. This galaxy has drifted too close to another nearby galaxy and the dramatic interaction has twisted its spiral arms out of shape, dragged streams of material out into space, and triggered bright bursts of star formation. NGC 7714 has witnessed some violent and dramatic events in its recent past. Tell-tale signs of this brutality can be seen in the galaxy’s strangely shaped arms, and in the smoky golden haze that stretches out from the galactic center. So what caused this disfigurement? 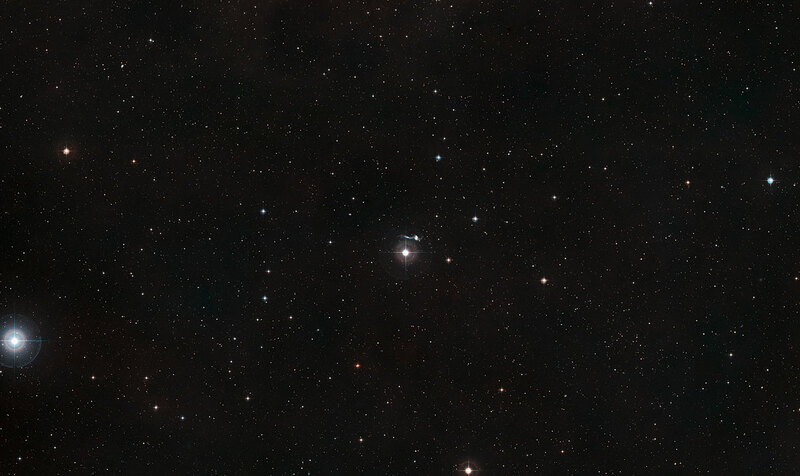 The culprit is a smaller companion named NGC 7715, which lies just out of the frame of this image — but is visible in the wider-field DSS image, as seen below. Wide-field image of NGC 7714 — In this image, the bright star you can see on the left is around a billion times closer than the galaxy. The two galaxies drifted too close together between 100 and 200 million years ago, and began to drag at and disrupt each others structure and shape. 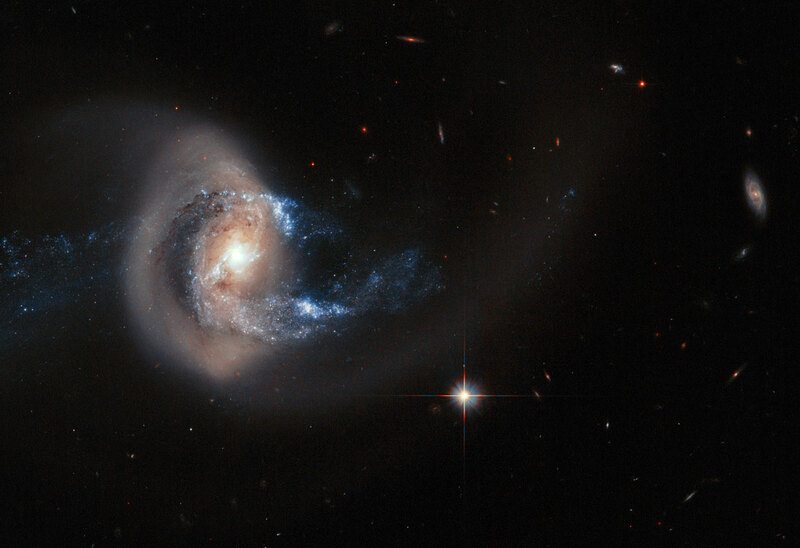 The interacting pair formed by NGC 7714 and NGC 7715 is named Arp 284. As a result, a ring and two long tails of stars have emerged from NGC 7714, creating a bridge between the two galaxies. This bridge acts as a pipeline, funneling material from NGC 7715 towards its larger companion and feeding bursts of star formation. Most of the star-forming activity is concentrated at the bright galactic center, although the whole galaxy is sparking new stars. Astronomers characterize NGC 7714 as a typical Wolf-Rayet starburst galaxy. This is due to the stars within it; a large number of the new stars are of the Wolf-Rayet type — extremely hot and bright stars that begin their lives with dozens of times the mass of the Sun, but lose most of it very quickly via powerful winds. This new picture not only reveals the intricate structure of NGC 7714, but also shows many other objects that are much further away. These background galaxies resemble faint smudges of light, some of them with spiral forms. This Hubble image is a composite of data capturing a broad range of wavelengths, revealing the correlation of the gas clouds and stars in the galaxy.